To recollect from my previous posts, I interviewed Una Tiers on my blog in January 2014 and reviewed her book Not Safe For The Bank(er) A Fonal Gavelle Mystery in December the same year. The interview was quite touchy and the book was a rare treat of mystery and fun. 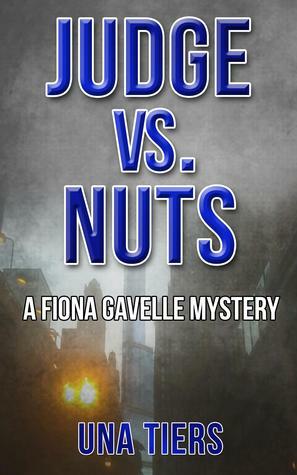 Here is a guest post from Una for her debut novel, JUDGE vs NUTS that is re-released in March of 2015. She is some presenting some insights, intereactive activities and celebration April month with a Sale. Reviews are important, they tell the author what the reader saw and they tell other people what to expect. They are hard to come by but treasured by authors. Please consider writing a review this month. Easy Bake Recipe for a Book Review. 1. Read the entire book. What was your general impression? Were you entertained, educated, did you laugh, did you love, like or enjoy the book? What stood out about the book? Was it humorous? Was there a quote you loved? Was there an idea it promoted? How did you feel about the characters? Do you recommend this book? Do you recommend it to particular readers? 5. For Amazon reviews you only need 20 words. You don’t need to tell the story, this isn’t a book report. 6. Say something nice. A book takes time and heartfelt effort to put together. It’s a little of the writer’s soul. Reviews are important to authors, please consider writing one today. Una Tiers is an attorney who writes mystery/humorcides. Her debut novel, JUDGE vs NUTS, was re-released in March of 2015. It is available on Amazon eBooks (links below) and is ON SALE! One snowy Chicago night, she learns she was fired from her miserable job and when her miserable husband doesn't support her plight, she walks out. However, after attending the funeral of a man she only met once, her luck turns. She gets new office space, and is taken in by her favorite Aunt. She struggles to prove the practice of law does not include car chases or running down the alley at midnight. Join Fiona to see where she leads you.